The large expanse of Suan Wachira Benchathat was once a private golf course for the exclusive use of State Railway employees. In the 1990s the union was convinced (not easily) to turn the land over to the city for a public park. 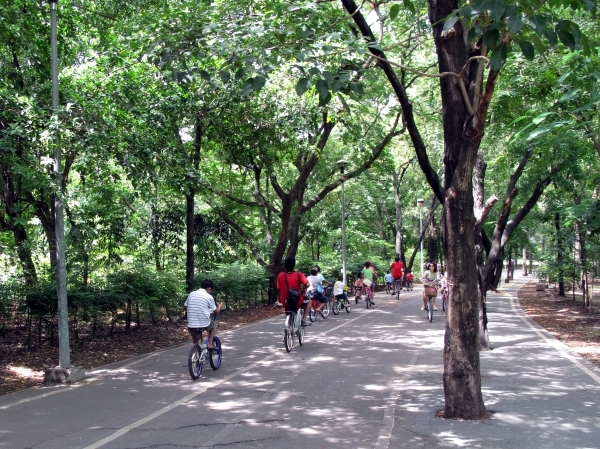 For a while, the entirety was simply one big park known as “Railroad Park” but then it was split in two, with the larger northern portion becoming Wachira Benchathat Park, while the southern portion became Queen Sirikit Park. The shady bike lanes of Wachira Benchathat Park on a sunny Sunday morning. Suan Wachira Benchatat still retains much of the character of a golf course. There are large expanses of open fields that were once fairways, separated by mature tree lines. The trees shelter pathways, which have become popular with cyclists, and there's even a place where you can rent bikes to ride through the park which does roaring business one the weekends. Aside from the bike paths, there are a number of other attractions spread around the park. At the far northern end is the new Buddhadasa Indapanno Archives, or “Suan Mokkh Bangkok” as it's also called. The lake-side post-modern building provides a cool, serene escape from the noise of the outside world. The north-eastern side of the park is lined with tennis, basketball and futsal courts as well as a public swimming pool. There is a large children's area on the western side while towards the southeast is a butterfly garden. If you get hungry exploring this large park, there is a huge collection of food stalls just outside the northwestern end of the park.